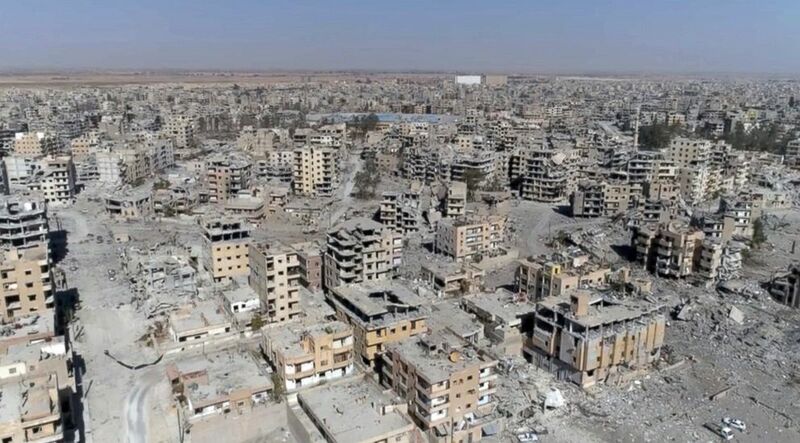 Though victory has been declared in the battle against ISIS in the Syrian city of Raqqa, drone footage and photos show a city decimated by a months-long siege and years of civil war. Syrian Democratic Forces (SDF) fighters ride atop of military vehicles as they celebrate victory in Raqqa, Syria, Oct. 17, 2017. Add ISIS as an interest to stay up to date on the latest ISIS news, video, and analysis from ABC News. Syrian Democratic Forces celebrated their hard-won victory around Naim Square, which was where ISIS fighters once carried out public beheadings and executions during their occupation of the city. Also known as "Paradise Square," it had been a symbol of brutality when Raqqa was the "capital" of ISIS's self-declared caliphate. 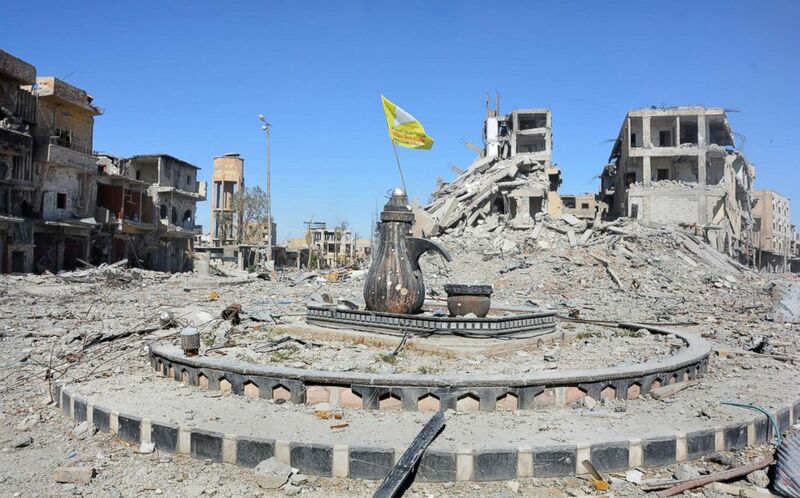 Naim Square roundabout following the liberation of Raqqa, Syria, Oct. 18, 2017. Now, the once-vibrant metropolis of 200,000 people has been left in ruins following fighting that began during the Syrian uprising and escalated with the arrival of ISIS in late 2013. 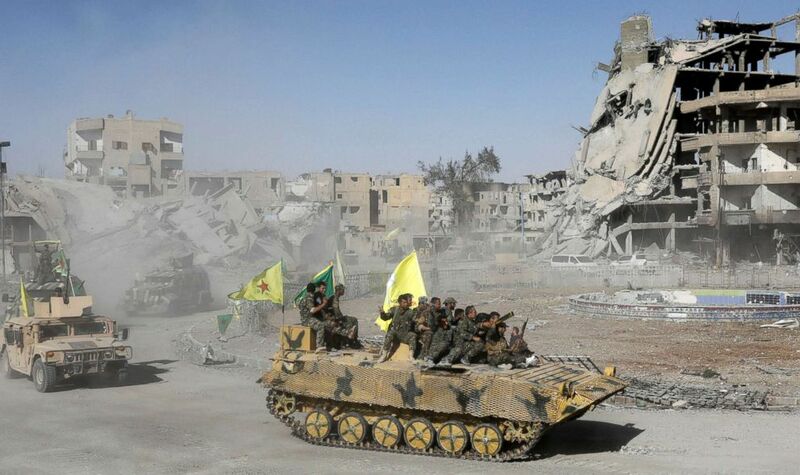 The battle to retake Raqqa began on June 6, following heavy airstrikes by U.S. forces. In the past few days, journalists were able to enter the war-torn city. Images show streets piled with debris and nearly every building appears to have suffered heavy damage. A fighter of Syrian Democratic Forces walks amidst the ruins of buildings in Raqqa, Syria, Oct. 18, 2017. 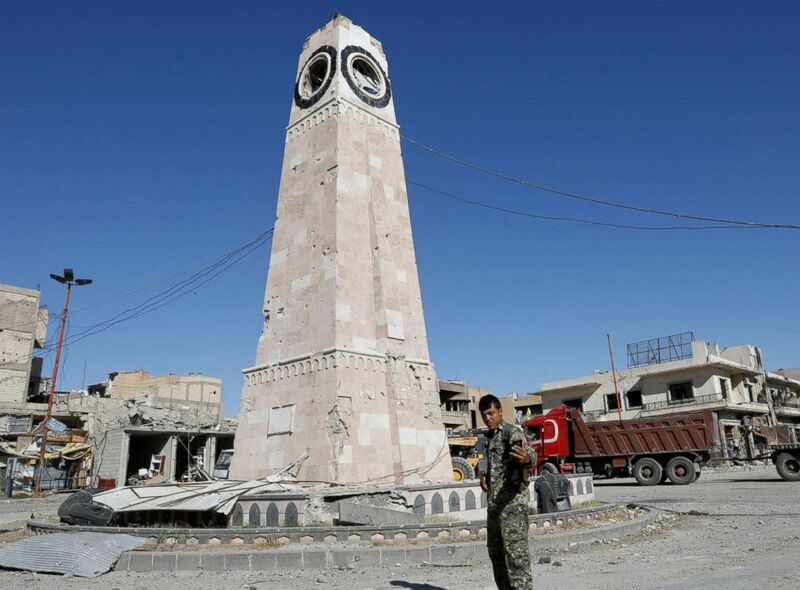 A fighter of Syrian Democratic Forces takes a selfie at a clock tower in Raqqa, Syria Oct. 18, 2017. 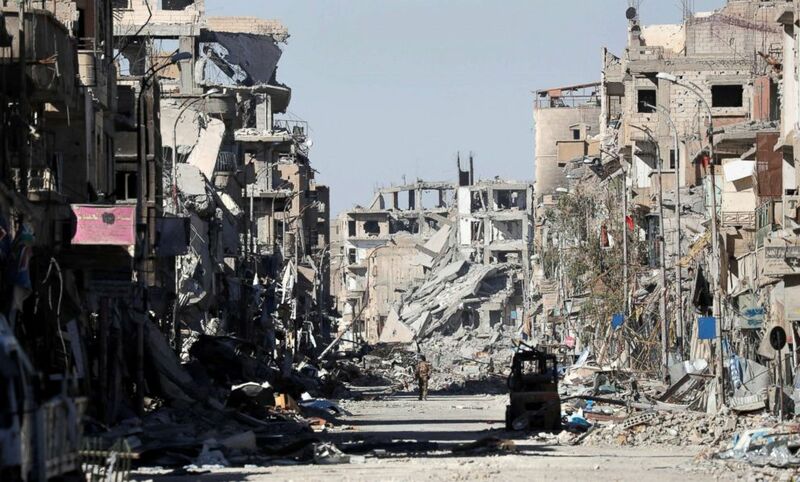 Raqqa will have to be cleared of landmines, explosives and other hazards before the long road to recovery can begin and residents can return. 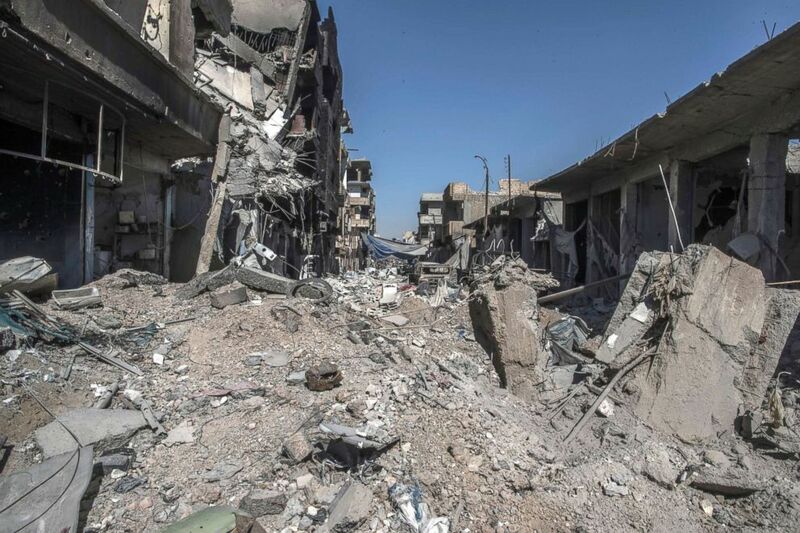 A heavily destroyed street in Raqqa, Syria, Oct. 19, 2017. An image taken from drone video shows damaged buildings in Raqqa, Syria, Oct. 19, 2017. 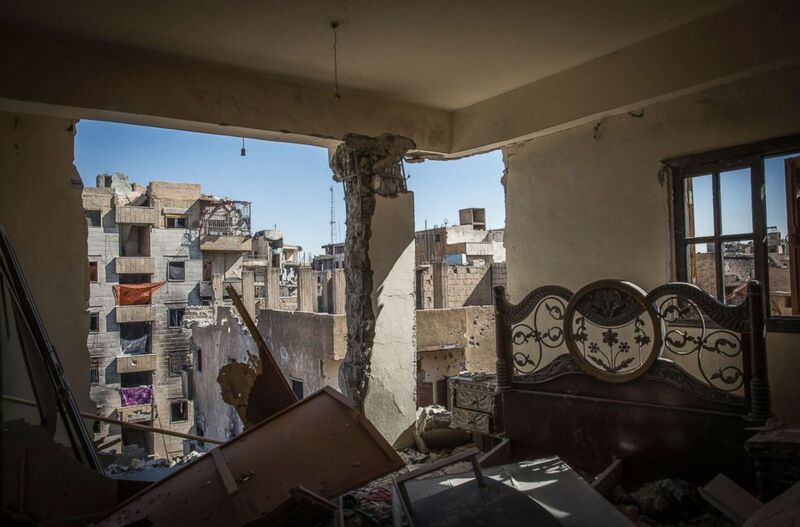 A destroyed bedroom in Raqqa, Syria, Oct. 16, 2017. 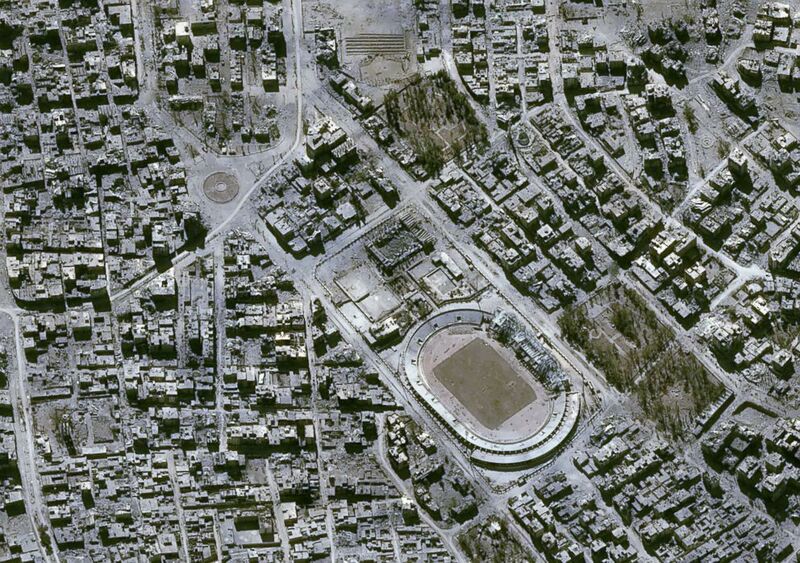 Central Raqqa showing Naim Square, top left, and the city's municipal stadium in a satellite image taken Oct. 16, 2017.